"Super atom" redirects here. For clusters of atoms that seem to exhibit some of the properties of elemental atoms, see Superatom. A Bose–Einstein condensate (BEC) is a state of matter of a dilute gas of bosons cooled to temperatures very close to absolute zero (-273.15 °C). Under such conditions, a large fraction of bosons occupy the lowest quantum state, at which point microscopic quantum phenomena, particularly wavefunction interference, become apparent macroscopically. A BEC is formed by cooling a gas of extremely low density, about one-hundred-thousandth the density of normal air, to ultra-low temperatures. This state was first predicted, generally, in 1924–1925 by Satyendra Nath Bose and Albert Einstein. Velocity-distribution data (3 views) for a gas of rubidium atoms, confirming the discovery of a new phase of matter, the Bose–Einstein condensate. Left: just before the appearance of a Bose–Einstein condensate. Center: just after the appearance of the condensate. Right: after further evaporation, leaving a sample of nearly pure condensate. ), are allowed to share a quantum state. Einstein proposed that cooling bosonic atoms to a very low temperature would cause them to fall (or "condense") into the lowest accessible quantum state, resulting in a new form of matter. On June 5, 1995 the first gaseous condensate was produced by Eric Cornell and Carl Wieman at the University of Colorado at Boulder NIST–JILA lab, in a gas of rubidium atoms cooled to 170 nanokelvins (nK). Shortly thereafter, Wolfgang Ketterle at MIT demonstrated important BEC properties. For their achievements Cornell, Wieman, and Ketterle received the 2001 Nobel Prize in Physics. Many isotopes were soon condensed, then molecules, quasi-particles, and photons in 2010. Interactions shift the value and the corrections can be calculated by mean-field theory. This formula is derived from finding the gas degeneracy in the Bose gas using Bose–Einstein statistics.
. If the two states are equal in energy, each different configuration is equally likely.
. The balance is a statistical effect: the number of configurations is largest when the particles are divided equally. cannot be determined, so each value of K determines a unique quantum state for the whole system. can be computed. It is the same as flipping a coin with probability proportional to p = exp(−E/T) to land tails.
. It does not grow when N is large; it just approaches a constant. This will be a negligible fraction of the total number of particles. So a collection of enough Bose particles in thermal equilibrium will mostly be in the ground state, with only a few in any excited state, no matter how small the energy difference.
. If the number of particles is less than the number of thermally accessible states, for high temperatures and low densities, the particles will all be in different states. In this limit, the gas is classical. As the density increases or the temperature decreases, the number of accessible states per particle becomes smaller, and at some point, more particles will be forced into a single state than the maximum allowed for that state by statistical weighting. From this point on, any extra particle added will go into the ground state. The original interacting system can be converted to a system of non-interacting particles with a dispersion law. In some simplest cases, the state of condensed particles can be described with a nonlinear Schrödinger equation, also known as Gross–Pitaevskii or Ginzburg–Landau equation. The validity of this approach is actually limited to the case of ultracold temperatures, which fits well for the most alkali atoms experiments. is representative of the inter-particle interactions.
. It is not applicable, for example, for the condensates of excitons, magnons and photons, where the critical temperature is comparable to room temperature. The Gross-Pitaevskii equation is a partial differential equation in space and time variables. Usually it does not have analytic solution and different numerical methods, such as split-step Crank-Nicolson  and Fourier spectral  methods, are used for its solution. There are different Fortran and C programs for its solution for contact interaction  and long-range dipolar interaction  which can be freely used. The Gross–Pitaevskii model of BEC is a physical approximation valid for certain classes of BECs. By construction, the GPE uses the following simplifications: it assumes that interactions between condensate particles are of the contact two-body type and also neglects anomalous contributions to self-energy. These assumptions are suitable mostly for the dilute three-dimensional condensates. If one relaxes any of these assumptions, the equation for the condensate wavefunction acquires the terms containing higher-order powers of the wavefunction. Moreover, for some physical systems the amount of such terms turns out to be infinite, therefore, the equation becomes essentially non-polynomial. The examples where this could happen are the Bose–Fermi composite condensates, effectively lower-dimensional condensates, and dense condensates and superfluid clusters and droplets. However, it is clear that in a general case the behaviour of Bose–Einstein condensate can be described by coupled evolution equations for condensate density, superfluid velocity and distribution function of elementary excitations. This problem was in 1977 by Peletminskii et al. in microscopical approach. The Peletminskii equations are valid for any finite temperatures below the critical point. Years after, in 1985, Kirkpatrick and Dorfman obtained similar equations using another microscopical approach. The Peletminskii equations also reproduce Khalatnikov hydrodynamical equations for superfluid as a limiting case. The phenomena of superfluidity of a Bose gas and superconductivity of a strongly-correlated Fermi gas (a gas of Cooper pairs) are tightly connected to Bose–Einstein condensation. Under corresponding conditions, below the temperature of phase transition, these phenomena were observed in helium-4 and different classes of superconductors. In this sense, the superconductivity is often called the superfluidity of Fermi gas. In the simplest form, the origin of superfluidity can be seen from the weakly interacting bosons model. In the image accompanying this article, the velocity-distribution data indicates the formation of a Bose–Einstein condensate out of a gas of rubidium atoms. The false colors indicate the number of atoms at each velocity, with red being the fewest and white being the most. The areas appearing white and light blue are at the lowest velocities. The peak is not infinitely narrow because of the Heisenberg uncertainty principle: spatially confined atoms have a minimum width velocity distribution. This width is given by the curvature of the magnetic potential in the given direction. More tightly confined directions have bigger widths in the ballistic velocity distribution. This anisotropy of the peak on the right is a purely quantum-mechanical effect and does not exist in the thermal distribution on the left. This graph served as the cover design for the 1999 textbook Thermal Physics by Ralph Baierlein. Bose–Einstein condensation also applies to quasiparticles in solids. Magnons, Excitons, and Polaritons have integer spin which means they are bosons that can form condensates. 3, at temperatures as great as 14 K. The high transition temperature (relative to atomic gases) is due to the magnons' small mass (near that of an electron) and greater achievable density. In 2006, condensation in a ferromagnetic yttrium-iron-garnet thin film was seen even at room temperature, with optical pumping. Polariton condensation was firstly detected for exciton-polaritons in a quantum well microcavity kept at 5 K.
is healing length of the condensate. demonstrates the correct behavior, and is a good approximation. singly charged vortices, indicating that these multiply charged vortices are unstable to decay. Research has, however, indicated they are metastable states, so may have relatively long lifetimes. Closely related to the creation of vortices in BECs is the generation of so-called dark solitons in one-dimensional BECs. These topological objects feature a phase gradient across their nodal plane, which stabilizes their shape even in propagation and interaction. Although solitons carry no charge and are thus prone to decay, relatively long-lived dark solitons have been produced and studied extensively. Experiments led by Randall Hulet at Rice University from 1995 through 2000 showed that lithium condensates with attractive interactions could stably exist up to a critical atom number. Quench cooling the gas, they observed the condensate to grow, then subsequently collapse as the attraction overwhelmed the zero-point energy of the confining potential, in a burst reminiscent of a supernova, with an explosion preceded by an implosion. Further work on attractive condensates was performed in 2000 by the JILA team, of Cornell, Wieman and coworkers. Their instrumentation now had better control so they used naturally attracting atoms of rubidium-85 (having negative atom–atom scattering length). Through Feshbach resonance involving a sweep of the magnetic field causing spin flip collisions, they lowered the characteristic, discrete energies at which rubidium bonds, making their Rb-85 atoms repulsive and creating a stable condensate. The reversible flip from attraction to repulsion stems from quantum interference among wave-like condensate atoms. When the JILA team raised the magnetic field strength further, the condensate suddenly reverted to attraction, imploded and shrank beyond detection, then exploded, expelling about two-thirds of its 10,000 atoms. About half of the atoms in the condensate seemed to have disappeared from the experiment altogether, not seen in the cold remnant or expanding gas cloud. Carl Wieman explained that under current atomic theory this characteristic of Bose–Einstein condensate could not be explained because the energy state of an atom near absolute zero should not be enough to cause an implosion; however, subsequent mean field theories have been proposed to explain it. Most likely they formed molecules of two rubidium atoms; energy gained by this bond imparts velocity sufficient to leave the trap without being detected. The process of creation of molecular Bose condensate during the sweep of the magnetic field throughout the Feshbach resonance, as well as the reverse process, are described by the exactly solvable model that can explain many experimental observations. How do we rigorously prove the existence of Bose–Einstein condensates for general interacting systems? Compared to more commonly encountered states of matter, Bose–Einstein condensates are extremely fragile. The slightest interaction with the external environment can be enough to warm them past the condensation threshold, eliminating their interesting properties and forming a normal gas. Nevertheless, they have proven useful in exploring a wide range of questions in fundamental physics, and the years since the initial discoveries by the JILA and MIT groups have seen an increase in experimental and theoretical activity. Examples include experiments that have demonstrated interference between condensates due to wave–particle duality, the study of superfluidity and quantized vortices, the creation of bright matter wave solitons from Bose condensates confined to one dimension, and the slowing of light pulses to very low speeds using electromagnetically induced transparency. Vortices in Bose–Einstein condensates are also currently the subject of analogue gravity research, studying the possibility of modeling black holes and their related phenomena in such environments in the laboratory. Experimenters have also realized "optical lattices", where the interference pattern from overlapping lasers provides a periodic potential. These have been used to explore the transition between a superfluid and a Mott insulator, and may be useful in studying Bose–Einstein condensation in fewer than three dimensions, for example the Tonks–Girardeau gas. Further, the sensitivity of the pinning transition of strongly interacting bosons confined in a shallow one-dimensional optical lattice originally observed by Haller|display-authors=et al has been explored via a tweaking of the primary optical lattice by a secondary weaker one. Thus for a resulting weak bichromatic optical lattice, it has been found that the pinning transition is robust against the introduction of the weaker secondary optical lattice. Studies of vortices in nonuniform Bose–Einstein condensates  as well as excitatons of these systems by the application of moving repulsive or attractive obstacles, have also been undertaken. Within this context, the conditions for order and chaos in the dynamics of a trapped Bose–Einstein condensate have been explored by the application of moving blue and red-detuned laser beams via the time-dependent Gross-Pitaevskii equation. Bose–Einstein condensates composed of a wide range of isotopes have been produced. Cooling fermions to extremely low temperatures has created degenerate gases, subject to the Pauli exclusion principle. To exhibit Bose–Einstein condensation, the fermions must "pair up" to form bosonic compound particles (e.g. molecules or Cooper pairs). The first molecular condensates were created in November 2003 by the groups of Rudolf Grimm at the University of Innsbruck, Deborah S. Jin at the University of Colorado at Boulder and Wolfgang Ketterle at MIT. Jin quickly went on to create the first fermionic condensate composed of Cooper pairs. In 1999, Danish physicist Lene Hau led a team from Harvard University which slowed a beam of light to about 17 meters per second,[clarification needed] using a superfluid. Hau and her associates have since made a group of condensate atoms recoil from a light pulse such that they recorded the light's phase and amplitude, recovered by a second nearby condensate, in what they term "slow-light-mediated atomic matter-wave amplification" using Bose–Einstein condensates: details are discussed in Nature. Another current research interest is the creation of Bose–Einstein condensates in microgravity in order to use its properties for high precision atom interferometry. The first demonstration of a BEC in weightlessness was achieved in 2008 at a drop tower in Bremen, Germany by a consortium of researchers led by Ernst M. Rasel from Leibniz University of Hanover. The same team demonstrated in 2017 the first creation of a Bose–Einstein condensate in space and it is also the subject of two upcoming experiments on the International Space Station. Researchers in the new field of atomtronics use the properties of Bose–Einstein condensates when manipulating groups of identical cold atoms using lasers. In 1970, BECs were proposed by Emmanuel David Tannenbaum for anti-stealth technology. P. Sikivie and Q. Yang showed that cold dark matter axions form a Bose–Einstein condensate by thermalisation because of gravitational self-interactions. Axions have not yet been confirmed to exist. However the important search for them has been greatly enhanced with the completion of upgrades to the Axion Dark Matter Experiment(ADMX) at the University of Washington in early 2018.
below 2.17 K is not a good example, because the interaction between the atoms is too strong. Only 8% of atoms are in the ground state near absolute zero, rather than the 100% of a true condensate. The bosonic behavior of some of these alkaline gases appears odd at first sight, because their nuclei have half-integer total spin. It arises from a subtle interplay of electronic and nuclear spins: at ultra-low temperatures and corresponding excitation energies, the half-integer total spin of the electronic shell and half-integer total spin of the nucleus are coupled by a very weak hyperfine interaction. The total spin of the atom, arising from this coupling, is an integer lower value. The chemistry of systems at room temperature is determined by the electronic properties, which is essentially fermionic, since room temperature thermal excitations have typical energies much higher than the hyperfine values. ^ S. N. Bose (1924). "Plancks Gesetz und Lichtquantenhypothese". Zeitschrift für Physik. 26 (1): 178–181. Bibcode:1924ZPhy...26..178B. doi:10.1007/BF01327326. ^ "Leiden University Einstein archive". Lorentz.leidenuniv.nl. 27 October 1920. Retrieved 23 March 2011. ^ A. Einstein (1925). "Quantentheorie des einatomigen idealen Gases". Sitzungsberichte der Preussischen Akademie der Wissenschaften. 1: 3. ^ Clark, Ronald W. (1971). Einstein: The Life and Times. Avon Books. pp. 408–409. ISBN 978-0-380-01159-9. ^ F. London (1938). "The λ-Phenomenon of liquid Helium and the Bose–Einstein degeneracy". Nature. 141 (3571): 643–644. Bibcode:1938Natur.141..643L. doi:10.1038/141643a0. ^ J. Klaers; J. Schmitt; F. Vewinger & M. Weitz (2010). "Bose–Einstein condensation of photons in an optical microcavity". Nature. 468 (7323): 545–548. arXiv:1007.4088. Bibcode:2010Natur.468..545K. doi:10.1038/nature09567. PMID 21107426. ^ N. N. Bogoliubov (1947). "On the theory of superfluidity". J. Phys. (USSR). 11: 23. ^ P. Muruganandam and S. K. Adhikari (2009). "Fortran Programs for the time-dependent Gross-Pitaevskii equation in a fully anisotropic trap". Comput. Phys. Commun. 180 (3): 1888–1912. arXiv:0904.3131. Bibcode:2009CoPhC.180.1888M. doi:10.1016/j.cpc.2009.04.015. ^ P. Muruganandam and S. K. Adhikari (2003). "Bose-Einstein condensation dynamics in three dimensions by the pseudospectral and finite-difference methods". J. Phys. B. 36 (12): 2501–2514. arXiv:cond-mat/0210177. Bibcode:2003JPhB...36.2501M. doi:10.1088/0953-4075/36/12/310. ^ D. Vudragovic; et al. (2012). "C Programs for the time-dependent Gross-Pitaevskii equation in a fully anisotropic trap". Comput. Phys. Commun. 183 (9): 2021–2025. arXiv:1206.1361. Bibcode:2012CoPhC.183.2021V. doi:10.1016/j.cpc.2012.03.022. ^ L. E. Young-S.; et al. (2016). "OpenMP Fortran and C Programs for the time-dependent Gross-Pitaevskii equation in a fully anisotropic trap". Comput. Phys. Commun. 204 (9): 209–213. arXiv:1605.03958. Bibcode:2016CoPhC.204..209Y. doi:10.1016/j.cpc.2016.03.015. ^ K. Kishor Kumar; et al. (2015). "Fortran and C Programs for the time-dependent dipolar Gross-Pitaevskii equation in a fully anisotropic trap". Comput. Phys. Commun. 195: 117–128. arXiv:1506.03283. Bibcode:2015CoPhC.195..117K. doi:10.1016/j.cpc.2015.03.024. ^ Beliaev, S. T. Zh. Eksp. Teor. Fiz. 34, 417–432 (1958) [Soviet Phys. JETP 7, 289 (1958)]; ibid. 34, 433–446 [Soviet Phys. JETP 7, 299 (1958)]. ^ M. Schick (1971). "Two-dimensional system of hard-core bosons". Phys. Rev. A. 3 (3): 1067–1073. Bibcode:1971PhRvA...3.1067S. doi:10.1103/PhysRevA.3.1067. ^ E. Kolomeisky; J. Straley (1992). "Renormalization-group analysis of the ground-state properties of dilute Bose systems in d spatial dimensions". Phys. Rev. B. 46 (18): 11749–11756. Bibcode:1992PhRvB..4611749K. doi:10.1103/PhysRevB.46.11749. PMID 10003067. ^ E. B. Kolomeisky; T. J. Newman; J. P. Straley & X. Qi (2000). "Low-dimensional Bose liquids: Beyond the Gross-Pitaevskii approximation". Phys. Rev. Lett. 85 (6): 1146–1149. arXiv:cond-mat/0002282. Bibcode:2000PhRvL..85.1146K. doi:10.1103/PhysRevLett.85.1146. PMID 10991498. ^ S. Chui; V. Ryzhov (2004). "Collapse transition in mixtures of bosons and fermions". Phys. Rev. A. 69 (4): 043607. arXiv:cond-mat/0211411. Bibcode:2004PhRvA..69d3607C. doi:10.1103/PhysRevA.69.043607. ^ L. Salasnich; A. Parola & L. Reatto (2002). "Effective wave equations for the dynamics of cigar-shaped and disk-shaped Bose condensates". Phys. Rev. A. 65 (4): 043614. arXiv:cond-mat/0201395. Bibcode:2002PhRvA..65d3614S. doi:10.1103/PhysRevA.65.043614. ^ A. V. Avdeenkov; K. G. Zloshchastiev (2011). "Quantum Bose liquids with logarithmic nonlinearity: Self-sustainability and emergence of spatial extent". J. Phys. B: At. Mol. Opt. Phys. 44 (19): 195303. arXiv:1108.0847. Bibcode:2011JPhB...44s5303A. doi:10.1088/0953-4075/44/19/195303. ^ a b "Eric A. Cornell and Carl E. Wieman — Nobel Lecture" (PDF). nobelprize.org. ^ C. C. Bradley; C. A. Sackett; J. J. Tollett & R. G. Hulet (1995). "Evidence of Bose–Einstein condensation in an atomic gas with attractive interactions" (PDF). Phys. Rev. Lett. 75 (9): 1687–1690. Bibcode:1995PhRvL..75.1687B. doi:10.1103/PhysRevLett.75.1687. PMID 10060366. ^ Baierlein, Ralph (1999). Thermal Physics. Cambridge University Press. ISBN 978-0-521-65838-6. ^ T. Nikuni; M. Oshikawa; A. Oosawa & H. Tanaka (1999). "Bose–Einstein condensation of dilute magnons in TlCuCl3". Phys. Rev. Lett. 84 (25): 5868–71. arXiv:cond-mat/9908118. Bibcode:2000PhRvL..84.5868N. doi:10.1103/PhysRevLett.84.5868. PMID 10991075. ^ S. O. Demokritov; V. E. Demidov; O. Dzyapko; G. A. Melkov; A. A. Serga; B. Hillebrands & A. N. Slavin (2006). "Bose–Einstein condensation of quasi-equilibrium magnons at room temperature under pumping". Nature. 443 (7110): 430–433. Bibcode:2006Natur.443..430D. doi:10.1038/nature05117. PMID 17006509. ^ Magnon Bose Einstein Condensation made simple. Website of the "Westfählische Wilhelms Universität Münster" Prof.Demokritov. Retrieved 25 June 2012. ^ C. Becker; S. Stellmer; P. Soltan-Panahi; S. Dörscher; M. Baumert; E.-M. Richter; J. Kronjäger; K. Bongs & K. Sengstock (2008). "Oscillations and interactions of dark and dark–bright solitons in Bose–Einstein condensates". Nature Physics. 4 (6): 496–501. arXiv:0804.0544. Bibcode:2008NatPh...4..496B. doi:10.1038/nphys962. ^ M. H. P. M. van Putten (2010). "Pair condensates produced in bosenovae". Phys. Lett. A. 374 (33): 3346–3347. Bibcode:2010PhLA..374.3346V. doi:10.1016/j.physleta.2010.06.020. ^ C. Sun; N. A. Sinitsyn (2016). "Landau-Zener extension of the Tavis-Cummings model: Structure of the solution". Phys. Rev. A. 94 (3): 033808. arXiv:1606.08430. Bibcode:2016PhRvA..94c3808S. doi:10.1103/PhysRevA.94.033808. 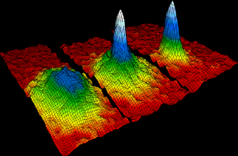 ^ "How to watch a Bose–Einstein condensate for a very long time - physicsworld.com". physicsworld.com. Retrieved 22 January 2018. ^ Gorlitz, Axel. "Interference of Condensates (BEC@MIT)". Cua.mit.edu. Archived from the original on 4 March 2016. Retrieved 13 October 2009. ^ Z. Dutton; N. S. Ginsberg; C. Slowe & L. Vestergaard Hau (2004). "The art of taming light: ultra-slow and stopped light". Europhysics News. 35 (2): 33–39. Bibcode:2004ENews..35...33D. doi:10.1051/epn:2004201. ^ "From Superfluid to Insulator: Bose–Einstein Condensate Undergoes a Quantum Phase Transition". Qpt.physics.harvard.edu. Retrieved 13 October 2009. ^ Elmar Haller; Russell Hart; Manfred J. Mark; Johann G. Danzl; Lukas Reichsoellner; Mattias Gustavsson; Marcello Dalmonte; Guido Pupillo; Hanns-Christoph Naegerl (2010). "Pinning quantum phase transition for a Luttinger liquid of strongly interacting bosons". Nature Letters. 466 (7306): 597–600. arXiv:1004.3168. doi:10.1038/nature09259. PMID 20671704. ^ Asaad R. Sakhel (2016). "Properties of bosons in a one-dimensional bichromatic optical lattice in the regime of the pinning transition: A worm- algorithm Monte Carlo study". Physical Review A. 94 (3): 033622. arXiv:1511.00745. doi:10.1103/PhysRevA.94.033622. ^ Roger R. Sakhel; Asaad R. Sakhel (2016). "Elements of Vortex-Dipole Dynamics in a Nonuniform Bose–Einstein Condensate". Journal of Low Temperature Physics. 184 (5–6): 1092–1113. doi:10.1007/s10909-016-1636-3. ^ Roger R. Sakhel; Asaad R. Sakhel; Humam B. Ghassib (2011). "Self-interfering matter-wave patterns generated by a moving laser obstacle in a two-dimensional Bose-Einstein condensate inside a power trap cut off by box potential boundaries". Physical Review A. 84 (3): 033634. arXiv:1107.0369. doi:10.1103/PhysRevA.84.033634. ^ Roger R. Sakhel; Asaad R. Sakhel; Humam B. Ghassib (2013). "Nonequilibrium Dynamics of a Bose-Einstein Condensate Excited by a Red Laser Inside a Power-Law Trap with Hard Walls". Journal of Low Temperature Physics. 173 (3–4): 177–206. doi:10.1007/s10909-013-0894-6. ^ Roger R. Sakhel; Asaad R. Sakhel; Humam B. Ghassib; Antun Balaz (2016). "Conditions for order and chaos in the dynamics of a trapped Bose-Einstein condensate in coordinate and energy space". European Physical Journal D. 70 (3): 66. arXiv:1604.01349. doi:10.1140/epjd/e2016-60085-2. ^ "Ten of the best for BEC". Physicsweb.org. 1 June 2005. ^ "Fermionic condensate makes its debut". Physicsweb.org. 28 January 2004. ^ Cromie, William J. (18 February 1999). "Physicists Slow Speed of Light". The Harvard University Gazette. Retrieved 26 January 2008. ^ N. S. Ginsberg; S. R. Garner & L. V. Hau (2007). "Coherent control of optical information with matter wave dynamics". Nature. 445 (7128): 623–626. doi:10.1038/nature05493. PMID 17287804. ^ Zoest, T. van; Gaaloul, N.; Singh, Y.; Ahlers, H.; Herr, W.; Seidel, S. T.; Ertmer, W.; Rasel, E.; Eckart, M. (18 June 2010). "Bose-Einstein Condensation in Microgravity". Science. 328 (5985): 1540–1543. Bibcode:2010Sci...328.1540V. doi:10.1126/science.1189164. ISSN 0036-8075. PMID 20558713. ^ DLR. "MAIUS 1 – First Bose-Einstein condensate generated in space". DLR Portal. Retrieved 23 May 2017. ^ Laboratory, Jet Propulsion. "Cold Atom Laboratory". coldatomlab.jpl.nasa.gov. Retrieved 23 May 2017. ^ "2017 NASA Fundamental Physics Workshop | Planetary News". www.lpi.usra.edu. Retrieved 23 May 2017. ^ P. Weiss (12 February 2000). "Atomtronics may be the new electronics". Science News Online. 157 (7): 104. doi:10.2307/4012185. JSTOR 4012185. Retrieved 12 February 2011. ^ Tannenbaum, Emmanuel David (1970). "Gravimetric Radar: Gravity-based detection of a point-mass moving in a static background". arXiv:1208.2377 [physics.ins-det]. ^ Dale G. Fried; Thomas C. Killian; Lorenz Willmann; David Landhuis; Stephen C. Moss; Daniel Kleppner & Thomas J. Greytak (1998). "Bose–Einstein Condensation of Atomic Hydrogen". Phys. Rev. Lett. 81 (18): 3811. arXiv:physics/9809017. Bibcode:1998PhRvL..81.3811F. doi:10.1103/PhysRevLett.81.3811. ^ "Bose–Einstein Condensation in Alkali Gases" (PDF). The Royal Swedish Academy of Sciences. 2001. Retrieved 17 April 2017. S. N. Bose (1924). "Plancks Gesetz und Lichtquantenhypothese". Zeitschrift für Physik. 26 (1): 178–181. Bibcode:1924ZPhy...26..178B. doi:10.1007/BF01327326. L. D. Landau (1941). "The theory of Superfluity of Helium 111". J. Phys. USSR. 5: 71–90. L. D. Landau (1941). "Theory of the Superfluidity of Helium II". Physical Review. 60 (4): 356–358. Bibcode:1941PhRv...60..356L. doi:10.1103/PhysRev.60.356. M. H. Anderson; J. R. Ensher; M. R. Matthews; C. E. Wieman & E. A. Cornell (1995). "Observation of Bose–Einstein Condensation in a Dilute Atomic Vapor". Science. 269 (5221): 198–201. Bibcode:1995Sci...269..198A. doi:10.1126/science.269.5221.198. JSTOR 2888436. PMID 17789847. C. Barcelo; S. Liberati & M. Visser (2001). "Analogue gravity from Bose–Einstein condensates". Classical and Quantum Gravity. 18 (6): 1137–1156. arXiv:gr-qc/0011026. Bibcode:2001CQGra..18.1137B. doi:10.1088/0264-9381/18/6/312. P. G. Kevrekidis; R. Carretero-González; D. J. Frantzeskakis & I. G. Kevrekidis (2004). "Vortices in Bose–Einstein Condensates: Some Recent Developments". Mod. Phys. Lett. B. 18 (30): 1481–1505. arXiv:cond-mat/0501030. Bibcode:2004MPLB...18.1481K. doi:10.1142/S0217984904007967. K.B. Davis; M.-O. Mewes; M.R. Andrews; N.J. van Druten; D.S. Durfee; D.M. Kurn & W. Ketterle (1995). "Bose–Einstein condensation in a gas of sodium atoms". Phys. Rev. Lett. 75 (22): 3969–3973. Bibcode:1995PhRvL..75.3969D. doi:10.1103/PhysRevLett.75.3969. PMID 10059782. .
D. S. Jin; J. R. Ensher; M. R. Matthews; C. E. Wieman & E. A. Cornell (1996). "Collective Excitations of a Bose–Einstein Condensate in a Dilute Gas". Phys. Rev. Lett. 77 (3): 420–423. Bibcode:1996PhRvL..77..420J. doi:10.1103/PhysRevLett.77.420. PMID 10062808. M. R. Andrews; C. G. Townsend; H.-J. Miesner; D. S. Durfee; D. M. Kurn & W. Ketterle (1997). "Observation of interference between two Bose condensates". Science. 275 (5300): 637–641. doi:10.1126/science.275.5300.637. PMID 9005843. Archived from the original on 12 October 2000. Retrieved 26 October 2017. .
E. A. Cornell & C. E. Wieman (1998). "The Bose–Einstein condensate". Scientific American. 278 (3): 40–45. Bibcode:1998SciAm.278c..40C. doi:10.1038/scientificamerican0398-40. M. R. Matthews; B. P. Anderson; P. C. Haljan; D. S. Hall; C. E. Wieman & E. A. Cornell (1999). "Vortices in a Bose–Einstein condensate". Phys. Rev. Lett. 83 (13): 2498–2501. arXiv:cond-mat/9908209. Bibcode:1999PhRvL..83.2498M. doi:10.1103/PhysRevLett.83.2498. E. A. Donley; N. R. Claussen; S. L. Cornish; J. L. Roberts; E. A. Cornell & C. E. Wieman (2001). "Dynamics of collapsing and exploding Bose–Einstein condensates". Nature. 412 (6844): 295–299. arXiv:cond-mat/0105019. Bibcode:2001Natur.412..295D. doi:10.1038/35085500. PMID 11460153. A. G. Truscott; K. E. Strecker; W. I. McAlexander; G. B. Partridge & R. G. Hulet (2001). "Observation of Fermi Pressure in a Gas of Trapped Atoms". Science. 291 (5513): 2570–2572. Bibcode:2001Sci...291.2570T. doi:10.1126/science.1059318. PMID 11283362. M. Greiner; O. Mandel; T. Esslinger; T. W. Hänsch & I. Bloch (2002). "Quantum phase transition from a superfluid to a Mott insulator in a gas of ultracold atoms". Nature. 415 (6867): 39–44. Bibcode:2002Natur.415...39G. doi:10.1038/415039a. PMID 11780110. .
S. Jochim; M. Bartenstein; A. Altmeyer; G. Hendl; S. Riedl; C. Chin; J. Hecker Denschlag & R. Grimm (2003). "Bose–Einstein Condensation of Molecules". Science. 302 (5653): 2101–2103. Bibcode:2003Sci...302.2101J. doi:10.1126/science.1093280. PMID 14615548. M. Greiner; C. A. Regal & D. S. Jin (2003). "Emergence of a molecular Bose−Einstein condensate from a Fermi gas". Nature. 426 (6966): 537–540. Bibcode:2003Natur.426..537G. doi:10.1038/nature02199. PMID 14647340. M. W. Zwierlein; C. A. Stan; C. H. Schunck; S. M. F. Raupach; S. Gupta; Z. Hadzibabic & W. Ketterle (2003). "Observation of Bose–Einstein Condensation of Molecules". Phys. Rev. Lett. 91 (25): 250401. arXiv:cond-mat/0311617. Bibcode:2003PhRvL..91y0401Z. doi:10.1103/PhysRevLett.91.250401. PMID 14754098. C. A. Regal; M. Greiner & D. S. Jin (2004). "Observation of Resonance Condensation of Fermionic Atom Pairs". Phys. Rev. Lett. 92 (4): 040403. arXiv:cond-mat/0401554. Bibcode:2004PhRvL..92d0403R. doi:10.1103/PhysRevLett.92.040403. PMID 14995356. C. J. Pethick and H. Smith, Bose–Einstein Condensation in Dilute Gases, Cambridge University Press, Cambridge, 2001. Lev P. Pitaevskii and S. Stringari, Bose–Einstein Condensation, Clarendon Press, Oxford, 2003. M. Mackie; K. A. Suominen & J. Javanainen (2002). "Mean-field theory of Feshbach-resonant interactions in 85Rb condensates". Phys. Rev. Lett. 89 (18): 180403. arXiv:cond-mat/0205535. Bibcode:2002PhRvL..89r0403M. doi:10.1103/PhysRevLett.89.180403. PMID 12398586. Easy BEC machine – information on constructing a Bose–Einstein condensate machine.